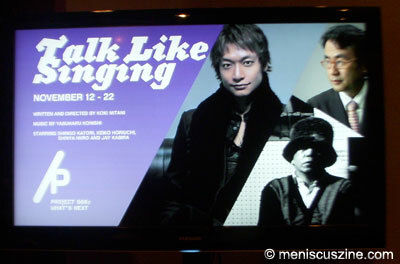 The world premiere of Japan’s original musical “Talk Like Singing” took place halfway across the world at New York University as part of a 10-day show run. The location is not altogether surprising given the Big Apple’s reputation for world-class theater and its strong Japanese expatriate population, and the standing ovation at the end of the 8 p.m. showing on Nov. 21, 2009, suggests more success for “Talk Like Singing” when the musical plays in its homeland in the near future. On the outset, the oddball plot doesn’t seem like it can support a two-hour live performance: a young man named Tarlow cannot hold a conversation unless he breaks into song and dance, and dueling scientific researchers (Dr. Dyson and Dr. Nimoy) try to help him assimilate into society by toning down – or even eliminating – his spontaneous melodic outbursts. But the end result is comedic, imaginative and touching, thanks to the lead triumvirate behind the production. Director and writer Koki Mitani’s deft execution, as shown in the hilariously offbeat ensemble comedy films “The Wow-choten Hotel” and “The Magic Hour,” translates well to the stage, and seamlessly moves between English and Japanese dialogue. Yasuharu Konishi’s musical score accompanies the story perfectly, and those familiar with his past life as a front man of the group Pizzicato Five will hear many of the big band influences that permeated such hit tunes as “Twiggy Twiggy vs. James Bond.” Then there is lead actor Shingo Katori as the naïve-but-fun-loving Tarlow, a huge star in his stage debut best known as one of the five members of Japanese boy idol group SMAP. It’s difficult to imagine any of the SMAP members other than Katori for this role, particularly given his infectious energy during concert performances and delightfully quirky characters in SMAP variety shows (yes, there are shades of “Shingo Mama” in his portrayal of Tarlow as a young boy). Katori spends most of the production prancing across the stage barefoot, singing in Japanese and English. This is not to take away from the rest of the cast and the band, as Katori is supported by just three other actors who wear so many hats that one would think the cast is actually four times the size. Jay Kibera puts in a memorable turn as the egocentric Dr. Dyson, whose ploy to rid Tarlow of his ability to sing reeks of self-serving gratification. Shinya Niiro showcases his multiple talents in a wildly diverse set of characters; to name just a few, one minute he’s the Afro-wearing, soul-bearing Brother, a flamboyant fast food manager admonishing Tarlow the next, and then a peon assistant to Dr. Dyson waiting for his own revenge. Keiko Horiuchi is solid as Dr. Nimoy but like Niiro, also has to take a schizophrenic role that sees her as a broadcast journalist among other personas. The talented pit orchestra – the band Tri4th – even takes the stage at one point, doubling as bit characters. It will be interesting to see how “Talk Like Singing” will play out in Japan, as the story’s narrative in the New York version favored an English-speaking audience. Some of the Japanese dialogue could have been benefited by subtitles, although the couple of times these were used, they were done in a very effective way as stage props. Despite these small gaps, “Talk Like Singing” is an entertaining way to spend two hours lost in Tarlow’s tune-filled mind. The New York finale of “Talk Like Singing” will be performed at NYU’s Jack H. Skirball Center for the Performing Arts on Sun., Nov. 22, at 3 p.m. Performances will be scheduled throughout Japan at later dates, including 50 shows at Tokyo’s Akasaka ACT Theater from Jan. 23-Mar. 7, 2010.